Honolulu Museum of Art » Sembene! Home / Events / Doris Duke Theatre / Films / Sembene! Directed by Samba Gadjigo, Jason Silverman. Senegal / USA. 2014. 89 min. French and English with English subtitles. In 1952, Ousmane Sembéne, a dockworker and fifth-grade dropout from Senegal, began dreaming an impossible dream: to become the storyteller for a new Africa. Sembene! tells the unbelievable true story of the “father of African cinema,” the self-taught novelist and filmmaker who fought, against enormous odds, to give African stories to Africans. During his 38-year career, he made nine films, taking on incendiary, politically charged subjects in a clear-eyed and startling way. Yet his work is not as well known as that of film pioneers from other parts of the globe. This intimate, insightful documentary seeks to correct that. 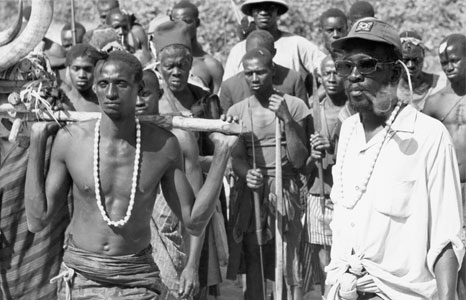 Told through the experiences of the man who knew him best, colleague and biographer Samba Gadjigo, using rare archival footage and candid interviews, Sembene! reveals how an ordinary man transformed himself into a fearless spokesperson for the marginalized, and became a hero to millions.